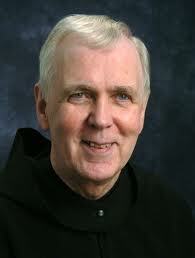 Father Kevin Seasoltz OSB died early today, 27 April 2013, at Saint John’s Abbey, Collegeville, MN. Father Kevin was born in Johnstown, Pennsylvania, 29 December 1930. He became a priest of the Diocese of Altoona-Johnstown, 3 June 1956. In 1958, he earned a license in canon law from the Lateran University with a concentration in liturgical law. After earning a degree in canon law, again with an emphasis on liturgical law, from The Catholic University of America, in 1962, he taught in the Religious Studies department until 1987. He professed vows as a monk of Saint Anselm’s Abbey, Washington, DC, 13 November 1960. He later transferred his monastic vow of stability to the Saint John’s Benedictine abbey after spending time on a working sabbatical. In 2009, the Federation of Diocesan Liturgical Commissions honored Dom Kevin with the Frederick R. McManus Award. Father Kevin was a professor of theology and a very well published author. For many years Dom Kevin served as editor of the revered Worship magazine, a quarterly of opinion. In the last months he’s been living with cancer; he received the sacraments of the Church on Friday. May Father Kevin rest in peace.